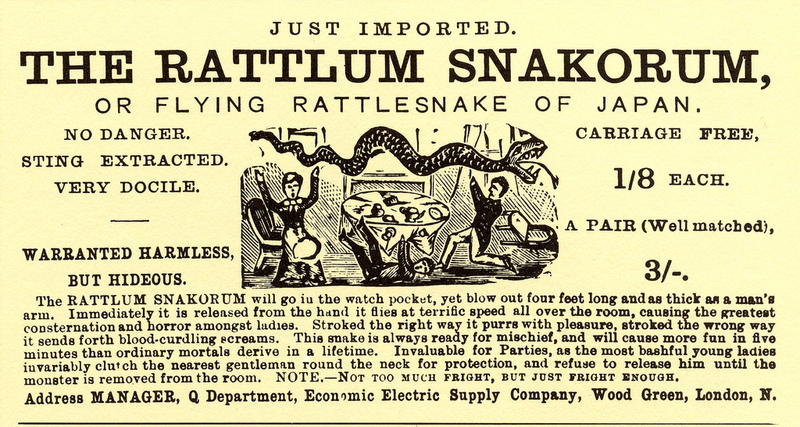 I first came across the Rattlum Snakorum, a Victorian paper novelty, at the Wellcome Trust’s library, while browsing some books of Victorian advertising for my second novel for children, The Mourning Emporium. I used the Rattlum Snakorum in the first draft of the book’s London section, in which a sentimental Cockney bulldog called Turtledove acts as a Fagin-like protector for a band of homeless children whose names include Greasy, Tig, and Hyrum. Tuttledove sends his beloved ‘childer’ out on missions that he calls ‘doings’. These consist not so much thieving as shifting dodgy products. ‘What kind of product?’ asked Teo. ‘Show them the Rattlum Snakorum,’ suggested Tig. Greasy handed Teo a gaudy confection out of packet. The be-ribboned box was illustrated with a picture of a girl screaming and half-a-dozen boys grinning hilariously while a long, thin black object hurtled around the room. Teo turned it over and read out loud the label. The RATTLUM SNAKORUM will go in the watch-pocket, yet blow out four feet long and as thick as a man’s arm. Immediately it is released from the hand it flies at terrific speed all over the room, causing the greatest consternation and horror amongst ladies. Stroked the right way it purrs with pleasure, stroked the wrong way it sends forth blood-curling screams. The snake is always ready for mischief, and will cause more fun in five minutes than ordinary mortals derive in a lifetime. Invaluable for Parties, as the most bashful young ladies invariable clutch the nearest gentlemen round the neck for protection, and refuse to release him until the monster is removed from the room. 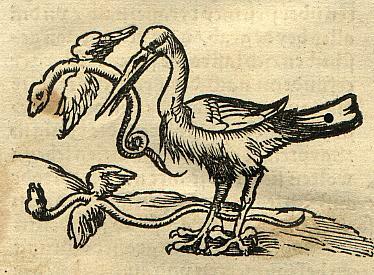 ‘Nice little earner,’ commented Turtledove. ‘Oh he don’t think he wants to do doings?’ Turtledove suddenly reared up at what seemed like twice his normal height. A back leg raised itself infinitesimally from the floor. After writing this scene, I became desperate to see and play with a real Rattlum Snakorum, because I had conceived a plot twist where it might be usefully deployed. But for that, I needed to know how it really worked. 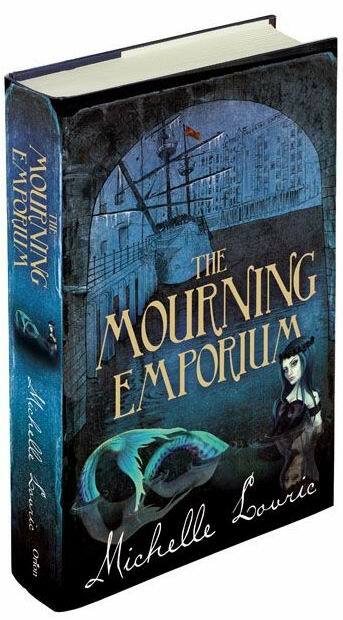 So I contacted the lovely Amoret Tanner, writer and collector, and a Founding Council member of the Ephemera Society. Amoret specializes in paper ephemera, so I asked her if she happened to have a Rattlum Snakorum in her archives. In the event, my Rattlum Snakorum scenes were cut from the book. But I was reminded of it recently when I saw a video on YouTube showing that some snakes can indeed fly, sort of. This National Geographic video shows how the flying snake stretches it ribs out and makes its belly concave so that it resembles a parachute. The snake then glides through the air as if through water. The performance is hypnotizing but the landings are not so graceful. I can imagine that the Rattlum Snakorum did not have many happy landings either. Victorian printers were masters of paper engineering. Some of their arts are now lost. When I worked as a book packager, I was constantly trying to induce printers in the Far East to simulate Victorian technology for pop-ups, embossing, die-cutting and honeycomb tissue paper. But, despite the best efforts of the excellent print-sourcers Imago, and the tortures I inflicted on the lovely people there, many of these arts are now lost, never to be recovered. Modern scientists have recreated the movement of the real flying snake using folded paper and many complicated calculations. As a Royal Literary Fund Fellow at Kings College, I helped one student writing his thesis on the kinetic properties of folded paper. From what I learned via my student, combined with my packager’s experience of Victorian paper engineering, I conclude that the Rattlum Snakorum used concertina’ed paper to simulate a similar manoeuvre to that deployed by the real flying snake: the act of throwing would cause the paper ribs to expand from their folds, and the beast would simulate a long glide, ‘growing’ as it flew, perhaps in the direction of an hysterical lady or two. Chrysopelea, the flying or gliding snake, lives in the forests of Southern Asia, rather than in Japan – though German cartographer Sebastian Münster claimed to have seen some in Africa in the 1550s. His snakes came complete with wings. (Image courtesy of Wikimedia Commons). But why must a flying snake be a thing of horror? Joanne Rand, an American country singer, has recorded a moving song called ‘Flying Rattlesnake’. She uses the snake as metaphor for unlikely regeneration in a bleak situation. The music and lyrics are here. Looking at what I’ve written here, I realize that the true joy of the Rattlum Snakorum for me lay in the peerless advertising copy. I did not believe for one moment that this novelty toy had any organic life. But as a researcher I had been captured by the grandeur of its promise to ‘cause more fun in five minutes than ordinary mortals derive in a lifetime’. Now I definitely know how to enjoy myself, but today I do feel a very ordinary mortal because I’ve never truly experienced a Rattlum Snakorum. I love this - peerless advertising copy indeed! I used to be passed on a lot of american magazines when I was a small girl in devon in the early 70's I spent longer gazing at the adverts than any sory, x ray specs, and sea monkeys! and many more unknowing joys, when my own kids were small I found and bought sea monkeys! we had them for a year or so but they eventually stopped recreating and I wanted my kitchen shelf back! But the remembered joy of wanting the magic tricks and xray specs and more has never faded!